The mythical creature–the dragon–has figured large in literature, movies, and culture, most especially in Eastern cultures. The view of the dragon between the East and the West could hardly be more polar opposite. In Western cutlure, the dragon for the most part is the demonic and destructive creature to be slayed. The mighty knight becomes the hero when he slays the dragon and saves the damsel in distress. The story line represents the defeat of evil and sin by the heroic and just. In the east, however, the dragon is a symbol of Imperial Power protecting weaker humans from evil spirits and the danger of the forces of nature, such as the wind and the rain. The dragon is also an emblem of joy and good health and even fertility. Because it represents goodness and a protective power, it has been adopted by emperors as symbols of their benevolent strength. 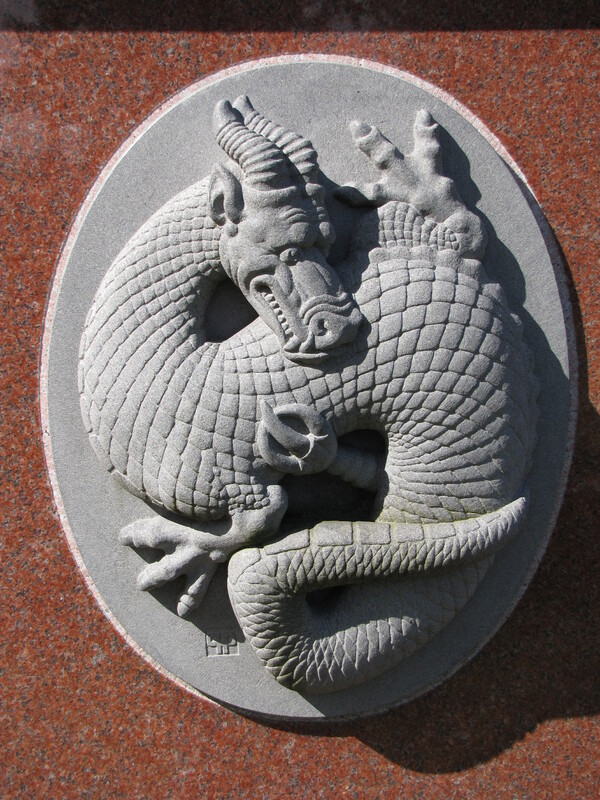 The intricately carved dragon in the photo above is found on the gravestone of an Asian family, which suggests that it represents, in this case, the dragon as a symbol of goodness. The first Reiki symbol or power symbol is sometimes called the Fire Dragon and is a virtually universal sign; the spiral is among the earliest drawings of man, and artifacts containing this picture have been observed in nearly every culture on Earth. The second symbol, the mental/emotional symbol is thought to enhance emotional psychological healing, is described as an “awakening dragon”; as well as a representation of the two lobes of the the brain, and as a representation of harmonizing yin and energies. Today there is an increase in blending the east and west understanding of archetypes and symbols in reference to the healing arts that is truly exciting. Knowledge of the use of the DRAGON as a source of power and energy is only one example.